That’s the attitude Manu Samoa Captain, Chris Vui, has adopted amidst a storm of criticisms from within and outside Samoa ahead of the must win Rugby World Cup qualifying test match against Germany this weekend. Speaking to the Samoa Observer yesterday, Vui said it has been tough. But he points out that the strength of the wolf is the pack. “During tough moments, we train really hard,” he said. “We want to keep going and to keep fighting until the end. What I believe in is that if there is a past there is also a future, as leaders and a tight group that we are, as brothers that we are. We will keep on going and we will keep on fighting because there is a future for this team. “It may not be now but Samoan rugby is a world class international team. So whatever that has happened it will not determine what would happen in the future because there are some great players in the team. Vui said he knows the German team is on the cusp of something great for their country. But he vows that Manu Samoa will not take a backward step on Saturday. “We are going to keep it simple,” he said. “We have had these Pacific Nations Cup matches to see our combinations and bringing in the experience of local players through as well. “I think now that we have finally had those two games, we've got a good balance of the players that we want to go against Germany. 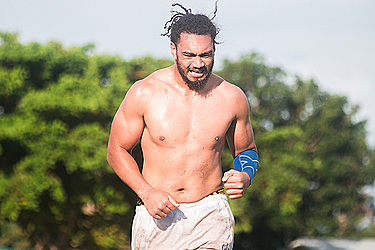 Vui said he is immensely proud to be the captain of the Manu Samoa. The former Captain of North Harbor, who made his Manu Samoa debut back in 2016, urges the country to rally behind the team. He is the third child of Seta and Kay Vui from the villages of Saasaai and Lano. Despite being born and raised in New Zealand, the 25-year-old Savaii lad has seen the love and passion his parents have for their motherland. In the 80s, his family migrated to New Zealand seeking better opportunities. It was those humble memories that keep the lock player driven in his career. “My parents were both born and raised here. Ever since I was little I have always fully supported the Manu Samoa team. I have this huge passion of what they do here and when I got into the team I didn’t know what the culture was,” he said. “The minute I got into the environment, it was such a culture shock. Ever since then I never looked back at representing Samoa. That main part would be the passion and love for my country and my parents. I am a New Zealand born, but all heritage and culture I am a Samoan. “My parents, they inspire me and have given up everything for me. Just like all the boys who are playing in the team, they do it for their families. These boys give up a lot to play for Samoa,” he told Samoa Observer. “Back in those days we had absolutely nothing there. Migrating to New Zealand was a new atmosphere. Giving up some stuff back then and coming now is for me to represent them. Life is a mystery and for him, growing up he wanted to be a carpenter, but as seasons change, he found himself wearing the blue jersey. “I didn’t play rugby until after high school. I joined rugby so I could play with my cousins and mates and one of the coaches saw me play and it all started from there. He also mentioned the reason he does not want to cut his hair, because he would like to describe himself as Chris the great from the Manu Samoa. “I have had my parents tell me to cut my hair so many times but I just have this urge to grow my hair. I have looked at Alesana, the Tuilagi brothers, some of the other boys. For Chris, regardless of their previous match results, it will never determine the future and what would happen next.